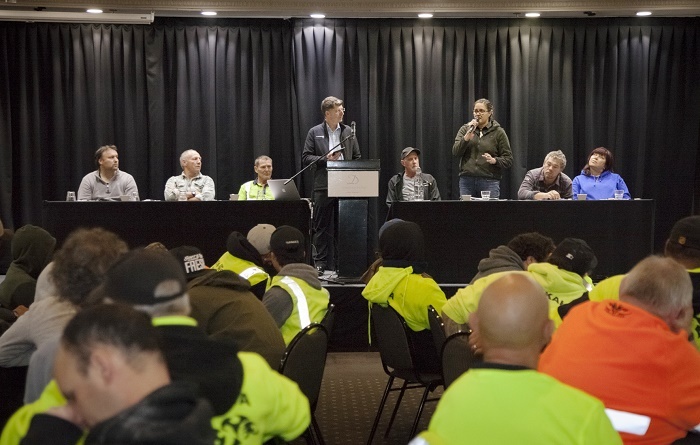 Safety breakfasts have historically been staged in January as a welcome back and to refresh forestry crews with safety messages before operations recommence work. This year, for the first time, PF Olsen held two mid-year “Safety Re-focus Breakfasts”. The first of these was on the 24th of July at the Distinction Hotel in Rotorua and the second at Te Whare o Tūhoe in Taneatua the following day. These events were attended by 385 people in total. The keynote speaker for both events was Steven Carden, the CEO of Landcorp (Pāmu). Steven generously volunteered his time to talk about the Pāmu ‘safety journey’ and the importance of safety leadership in the organisation. Steven asked the audience to think about family and their loss and reminded us that there are no number of injuries that is acceptable. Individuals need to own safety – it’s your job to do the job safely! Leaders must be non-negotiable on safety standards – one rule for all, applied by all, no exceptions! Don't declare victory too soon – watch out for complacency, know that while safety improves, the job is never finished! Both breakfasts featured panel discussions with each panel including safety leaders – contractor principals and past safety champions that have shown outstanding safety leadership. They answered questions about what had made them successful with regard to health and safety in their business and daily work. The panel discussion was a new addition to the breakfast’s format and a new experience for the panelists. Everyone in attendance enjoyed the information shared, the depth of the comments and the strong will to do safety in the right way. The breakfasts were also an opportunity to celebrate an outstanding safety achievement. Earlier this year contractors and staff collectively achieved a new safety performance milestone. This was in our OTPP NZ operations where collectively, staff and contractors achieved 18 months (in excess of 1 million hours) without a Lost Time Injury. OTPP NZ wanted to celebrate this achievement in a special way and agreed to thank the 413 people involved with a personalised letter of thanks and a $100 grocery voucher. The letter and voucher were sent to each person’s home address acknowledging the families' contribution to the achievement. The response has been overwhelmingly favourable – so a big thanks to all contributors, their families and to the OTPP NZ Board of Directors for this outstanding initiative and safety excellence. Rona Wheeldon speaking during the panel discussion in Rotorua.